In Other Media-e.g. Somalia, Nepal, Ghana, Azerbaijan, The Gambia For further info, click here to contact us . These reports are also available on Lexis-Nexis, though not, for now at least, on Google News. UNITED NATIONS, February 14 -- Google, after being publicly questioned at the UN about not signing on to the human rights and anti-censorship principles of the Global Compact, responded not by joining the Compact and foreswearing from censorship but by moving to de-list from its Google News service the media organization which raised the question. More than two years after Inner City Press was included into Google News, in a February 8 message referring to the receipt of a complaint, Google said it would be removing Inner City Press from the news database. In late 2007, Google's chief technologist Michael T. Jones took questions at a UN press conference with UN Secretary General Ban Ki-moon and UN Development Program chief Kemal Dervis promoting Google's involvement in mapping the UN's anti-poverty Millennium Development Goals. Inner City Press, accredited media at the UN, asked Mr. Jones if Google was a member of the UN Global Compact, through which corporations sign up to principles of human rights including non-censorship. Video here, from Minute 30:21. Google's Jones at first delayed answering the questions, noting that Google was the third of Inner City Press' three questions -- the first two were to the UN Development Program's Kemal Dervis about the absence of North Korea from the data base, the second to Cisco about censorship. 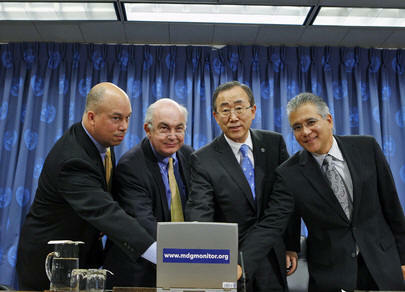 Then, on camera, Jones said he did not know of Google was a member of the UN Global Compact, that he would reply later. Video here, from Minute 32:37. While Google is said to have a contract with UNDP, Google was not a member of the Global Compact then, and is not one as of this writing. Rather, Inner City Press was notified by "Google Team," with no further attribution, that it would be de-listed from the Google News service, in which it had been included since 2005. Google's notification referred to "user complaints." Inner City Press immediately asked to be informed of the identity of any institutional complainant, including Google itself. Beyond that, certainly, there are others with complaints about Inner City Press' investigative coverage, at the UN, in Myanmar, UNDP and elsewhere. In fact, UNDP sources describe communications from the UN system to Google executives, asking that Inner City Press be de-listed from Google News, and that a well-read blog, UNDP-Watch, be striken from that data base. Recently a whistleblower in UNDP's legal department had his office computer impounded and was told, you have visited InnerCityPress.com multiple times. While the interrogation reflected contempt for the freedom to read and freedom of the press, the issue goes far beyond the corporate culture at UNDP, to that of Google. Google's Sergey Brin and Larry Page have each been quoted dodging the question of Google's participation in the Chinese government's censorship of the Internet, saying only that Google contacted Beijing and came to an understanding. It now appears that after getting a taste of censorship in China -- and in Egypt, by some accounts -- Google has in this case brought the practice home to the United States. Inner City Press, alongside requesting the name of institutional complainants and to be maintained in Google News, sought comment by e-mail from press@google.com and from Google's Michael T. Jones, whom it questioned at the UN. The latter has not responded. From press@google.com came a series of questions, which once answered, resulted in a vague assurance that indexing would continue. But Inner City Press' two stories datelined Wednesday night, about a lack of transparency at the UN and its soft approach to Myanmar's military regime, were not included in Google News. Thursday afternoon, Nancy Ngo of Google's office of Global Communications stated that Inner City Press would be included "in a few weeks." But why was it removed? Developing -- Inner City Press remains included in Lexis-Nexis, ProQuest and other non-conflicted news data bases. We periodically review news sources, particularly following user complaints, to ensure Google News offers a high quality experience for our users. When we reviewed your site we've found that we can no longer include it in Google News. Full disclosure: should be clear from the above.